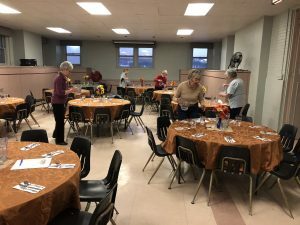 Cold and drizzle didn’t keep folks away from October’s Community Dinner; we had a great turnout – 75 guests joined us including 10-12 young children. 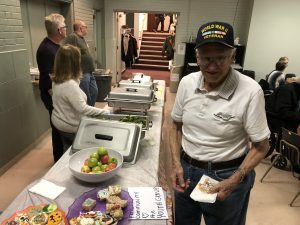 The menu was another favorite from the past – Halloween Chili with available toppings of tortilla chips, cheese, onions and jalapenos, along with a veggie filled tossed green salad, fresh fruit and homemade desserts. We want to say a special Thank You to Allie and the Youth group at FPCL for making all the fun Halloween cookies and treats for the past two years. They are so appreciated and enjoyed by all.